Samford University’s Cumberland School of Law held its spring 2018 commencement ceremony May 11 in the Leslie Stephen Wright Fine Arts Center. Cumberland distributed 121 Juris Doctor degrees at the springtime event, 11 of which received a dual degree. Two recipients of the Master of Comparative Law (M.C.L.) degree from Brazil were unable to attend. The M.C.L. program is designed for graduate lawyers, judges, prosecutors and legal educators from outside the U.S. who learn about the U.S. legal system and culture. The ceremony began with Professor William Ross leading the processional as the mace bearer. Professor Alyssa DiRusso provided the invocation followed by a hymn and a welcome from Samford University President Andrew Westmoreland. Dean Henry C. Strickland III then made the presentation of the Daniel Austin Brewer Professionalism Award to Alexander (Alex) G. Thrasher. This award was endowed by Governor Albert P. Brewer, a former distinguished professor of law and government and professor Emeritus at Cumberland, in honor of his father. Each year, the award is granted to a third-year Cumberland student who best exemplifies the high standards of ethics and professionalism expected of members of the legal profession. While a student at Cumberland, Thrasher was a first-year honor court justice from 2015-2016 elected by his peers, served as junior editor of the Cumberland Law Review from 2016-2017 and was a research editor for Law Review from 2017-2018. He was a recipient of a merit scholarship, an Elite Eight competitor in the Williams first year trial competition, a street law program teacher and a Caruthers Fellow. He graduated on Friday in the top four percent of his class. Strickland remained to introduce the keynote speaker, United States Magistrate Judge and former Cumberland professor Herman N. Johnson Jr. Appointed to his position in June 2017, Johnson began by stating how happy he was to be there and his love for Cumberland School of Law. 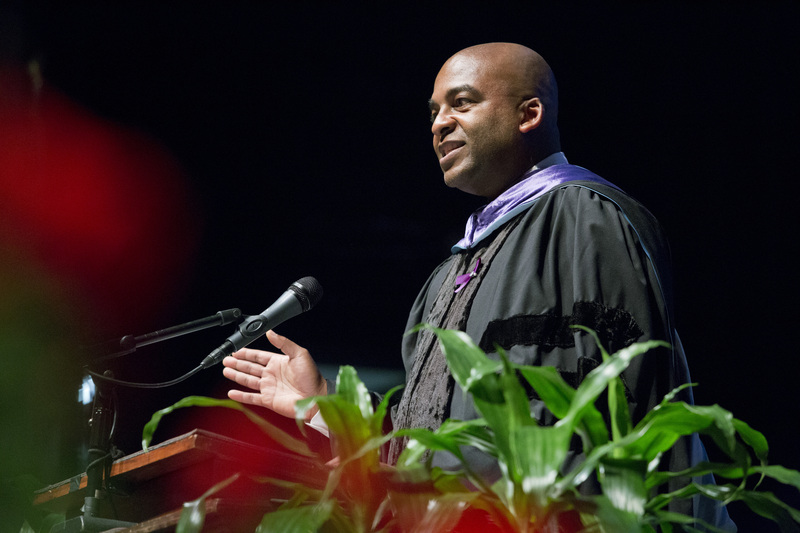 Johnson advised the graduates to bear in mind three attitudes in life: be open, be accountable, and be vulnerable. He expanded on these points by providing examples from his time in the Peace Corps as well as examples from other prestigious Cumberland alumni. Prior to his appointment, Johnson enjoyed a wide-ranging legal career in private practice, academia and the court system. While serving as a professor at Cumberland, Johnson continuously taught several courses conducive to litigation in federal courts including civil procedure, evidence, comparative procedure (civil and criminal), federal courts, equitable remedies, civil rights and complex litigation. Following Johnson’s address, retiring law professors Michael Floyd and Bob Greene were recognized for their years of service to Cumberland and to Samford by Provost and Vice President for Academic Affairs J. Michael Hardin. Then, the presentation and conferring of degrees was provided by Hardin and President Westmoreland, respectively. Associate Dean and Professor Brannon Denning announced the names of the graduates and professors Brad Bishop, Jill Evans and John Carroll assisted in the hooding of the graduates. “You will always be a part of our Cumberland family,” Strickland said to the class. He then recognized and honored classmate Drew Bentley, who was set to graduate with this class but died last year. During the ceremony, many members of the graduating class wore purple lapel ribbons in memory of Bentley. The ribbons represented the students’ support of the Matthew McLain Peer Scholarship in remembrance of Bentley. Before the singing of the Alma Mater, Juris Doctor graduate and Senior Class President Benjamin Keen, provided farewell remarks. He reflected on the group’s three years in law school and offered encouragement to the graduates while also making a nod to Bentley in his remarks. To close, Floyd provided the benediction. Prior to the ceremony, Cumberland held a reception for the graduates and their families in Brewer Plaza in front of the law school.